I can never tell if my drunken dialogue sounds authentic or not. I really should drink more. 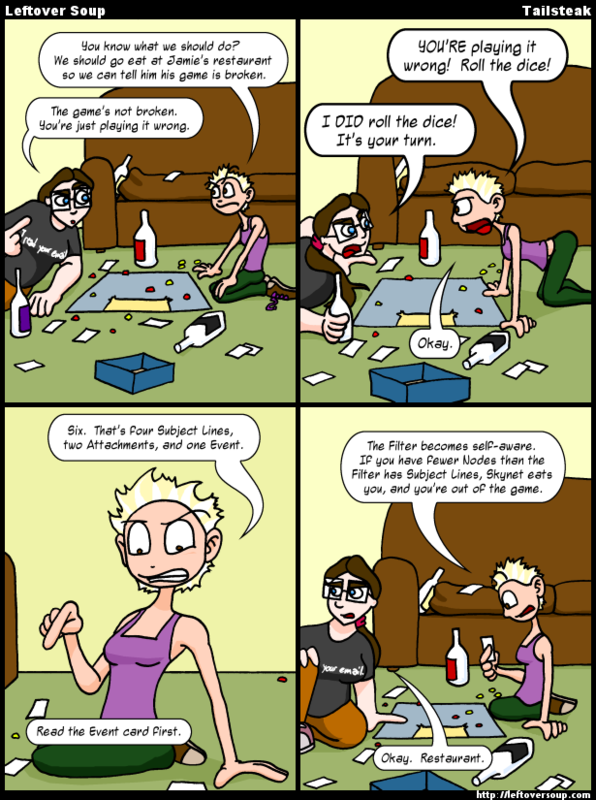 On an unrelated note, I think if I found drunk people abusing one of my homemade board games the way Ellen and Max appear to be doing, I'd be rather upset. MH: You know what we should do? We should go eat at Jamie's restaurant so we can tell him his game is broken. EB: The game's not broken. You're just playing it wrong. MH: YOU'RE playing it wrong! Roll the dice! EB: I DID roll the dice! It's your turn. MH: Six. That's four Subject Lines, two Attachments, and one Event. EB: Read the Event card first. MH: The Filter becomes self-aware. If you have fewer Nodes than the Filter has Subject Lines, Skynet eats you, and you're out of the game.